The Rev. Kacei Conyers will be our celebrant at both services and Rev. Claire will be preaching. The altar flowers have donated by Karen and Allen Rudolph in honor of their mother Betty. The Ventana School Choristers will be singing at the 10:15 a.m. service. CSA Food Drive: Donations can be dropped off at either service. CSA is in need of healthy and nutritious non-perishable items, including boxes of cereal, oatmeal, pop-top canned food items (fruits, vegetables, meat, etc. ), flour, oil, condiments, salad dressings, etc. CSA no longer wants bulk packaged items that they have to divide out into individual packages - no 10 lb bags of rice, no restaurant size mustard dispensers. Please keep items to individual family sized packaging - yes to 10 individual cans of tuna packaged together as this is essentially individual cans. Sunday Worship: 8:00 a.m. Eucharist in the Church; 10:15 a.m. Choral Eucharist in the Church; Creative Holy Play for preschool through pre-teen during the 10:15 a.m. service; Youth Group meets after the 10:15 a.m. service. Sunday's lesson can be found online by clicking here. Rise Against Hunger Meal Packing Service Event -- TOMORROW! 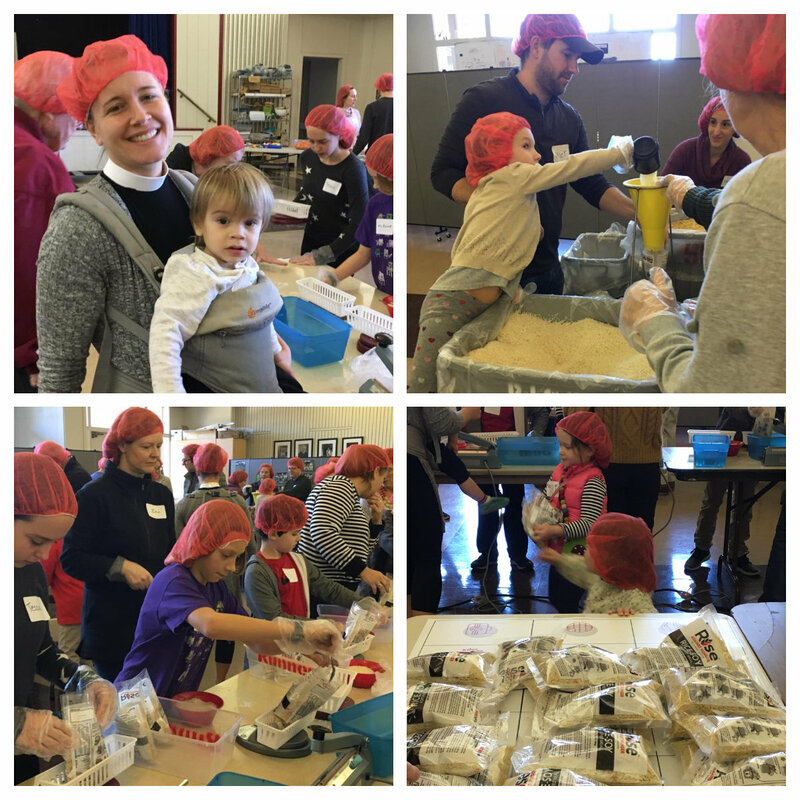 Join members of the Christ Church and Ventana School community on Saturday, February 9, 10:00 a.m.-12:00 p.m. as we package meals to serve an impoverish ed community through Rise Against Hunger, an international aid organization. Last year this proved to be a fun, energizing and inspiring event as we came together to make a positive impact and provide food for over 10,000 families. This is a family-friendly service opportunity and children of all ages (see photos from last year) are encouraged to participate - there is something for everyone to do. Your RSVP will help us to plan for the correct number of packaging stations and to ensure we have enough snacks and supplies for everyone. Please click here to register to take part in this community event. Cantabile Premiering Original Piece by Eric Tuan - THIS WEEKEND! 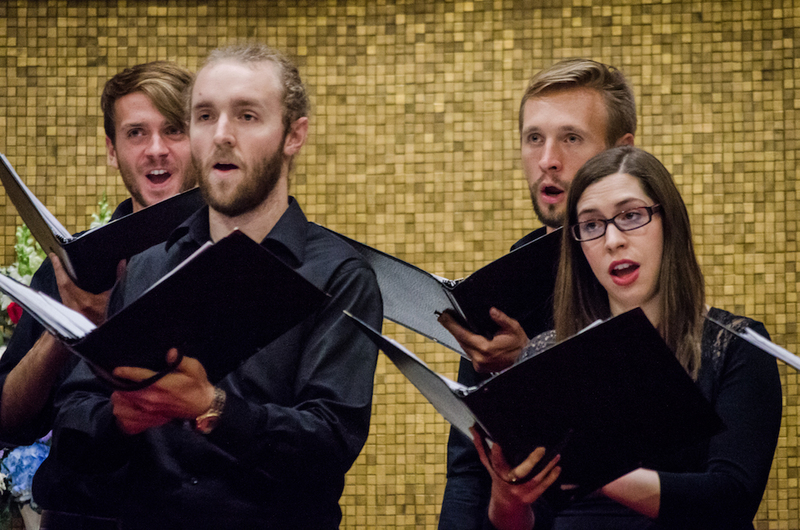 The Cantabile Youth Singers of Silicon Valley, whose top performing groups rehearse on our campus (see more information below), will be premiering a new piece by our music director Eric Tuan this weekend. The performances, which are a collaboration with professional vocal octet Gaude, take place on Saturday, February 9 (7:30 pm) at Noe Valley Ministry in San Francisco, and on Sunday, February 10 (7:30 pm) at First United Methodist Church in Palo Alto. More information can be found here. Eric's new piece, titled "From the Window of Despair," explores poetry written in the Japanese-American internment camps - a story that is closely bound up with the Christ Church community as well. The Christ Church Men’s Group will be having their next dinner on Tuesday, February 12, at 6:00 p.m. Mark your calendars and plan to be there for a great dinner, fellowship and our guest speaker, Rev. Claire -- Who is that Woman Behind the Collar: Rev. Claire Tells All. Meal donations of $10 are suggested. All are welcome!. For planning purposes, please RSVP to Bob Stanfield (kasras@aol.com). Starting on Saturday, February 23, 10:30-11:45 a.m., we will be delighted to offer a monthly Sacred Heart Yoga Class meeting every fourth Saturday of the month in the Chapel (additional classes on March 23, April 27 and May 25 through the Spring). Sacred Heart Yoga combines heart-centered spoken prayer with gentle stretching movements and provides a pathway to inner peace, wisdom, divine guidance, wholeness, and an ever-deepening connection to God within. This form of yoga embodies the original Aramaic Lord's Prayer of Jesus and is often considered less physically demanding than hatha or vinyasa yoga, with which many people are more familiar. The class will be led by Joan Loney, a certified Sacred Heart Yoga Instructor and friend of the parish. A $15 suggested donation will be welcome but don't let that keep you from coming to the class. Bring a yoga mat and wear light comfortable clothing that allows for freedom of movement (we'll have some extra mats on hand if you don't have your own). A blanket and/or cushion are optional. All are welcome! It's hard to believe that Lent is nearly upon us! Lent offers a time of reflection and self-examination in anticipation of the dawning joy of Easter. The 40-day season begins on Ash Wednesday, March 6, with the imposition of ashes, a somber reminder of our mortality, and Eucharist at 6:00 p.m. in the Church. 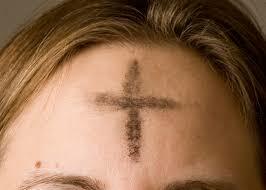 If you are unable to attend services that evening, we welcome you to get your "Ashes to Go" from Rev. Claire at 12 noon in downtown Los Altos outside the Starbucks at the corner of Main Street and Second Street. The next offering in our Living Harmony: Arts at Christ Episcopal Church concert series will be on Saturday, March 9 at 4:00 p.m. Celebrate international Women's Day in song and story with the uplifting and virtuosic voices of Convivium. Inspired by Maya Angelou's beloved poem "Still I Rise," the program weaves together music by some of today's leading female composers with poetry by women of color. The music includes Melissa Dunphy's powerful reflection on the immigrant experience, American DREAMers; Anna Thorvaldsdottir's stunning setting of an old Icelandic psalm; and works by Meredith Monk, Rosephanye Powell, Elizabeth Alexander, and Ysaÿe M. Barnwell. As many of you may be aware, we have begun a relationship with the Cantabile Youth Singers of Silicon Valley. They are using our parish hall for rehearsals on Monday and Thursday evenings, and Eric Tuan, our music director, has composed a piece for them which they will premiere at an upcoming choral convention. Cantabile will be holding its annual Gala Concert, Dinner and Fundraising Auction on Saturday, March 9, at 6:00 p.m. For more information and to purchase tickets, click here. Homelessness affects many people in our community. Empty Bowls Soup Supper provides a unique and cost-effective opportunity for us to help. 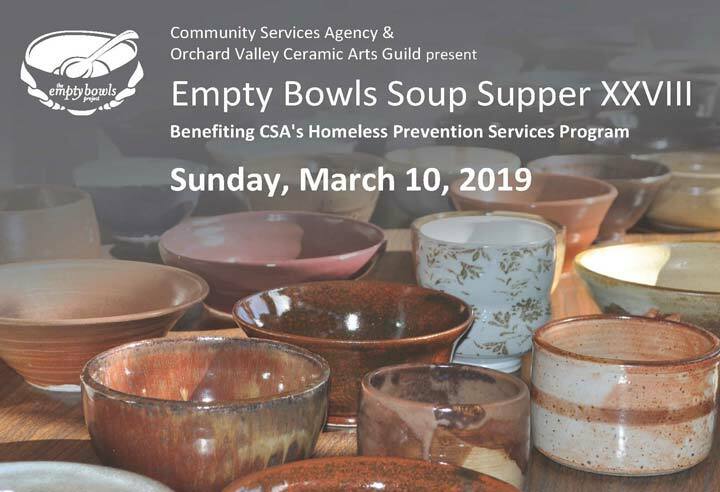 O n Sunday, March 10, Community Services Agency (CSA) will be hosting the 2019 Empty Bowls Soup Supper. Join us for soup, salad, cake and beverage and take home an original handcrafted ceramic bowl! This popular community event will be held at the Central Seventh Day Adventist Church, 1425 Springer Road, Mountain View. New this year, there will be two seatings, 3:00-4:30 p.m. and 5:00-6:30 p.m. Early bird ticket rates through February 28 (prices increase $5 on March 1): $25 for seniors; $35 adults and teens 12+; $10 for children under 12. Tickets can be purchased here. Funds raised benefit CSA’s Homeless Prevention Services Program. Office Hours: Monday through Friday, 9:00 a.m.- 4:00 p.m. Rev. Claire will be out on vacation beginning Wednesday, through February 27. Missed Church Last Sunday? You can watch and/or read the sermon online here. 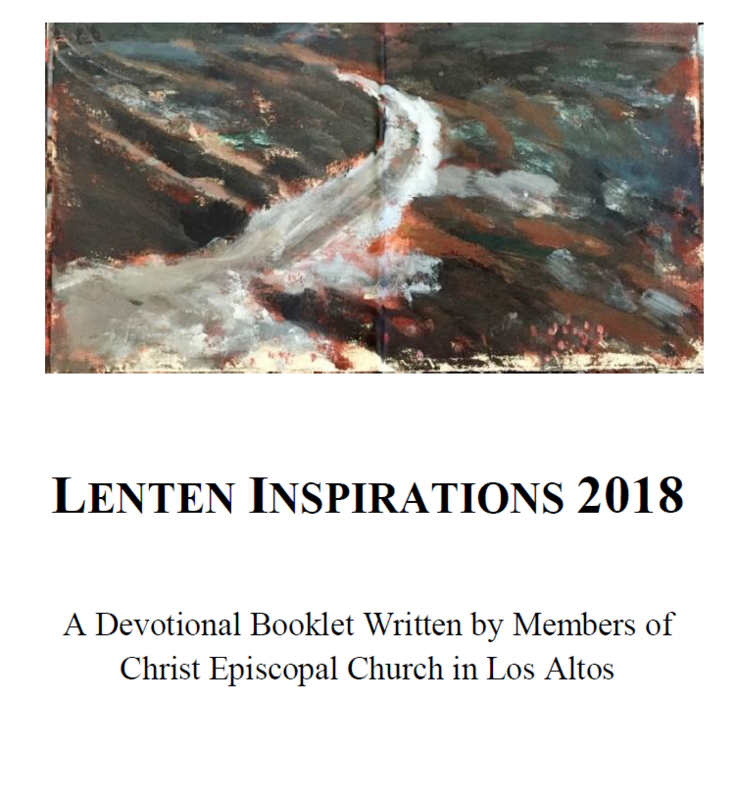 Building on the success of last year's Lenten Inspirations booklet, you are invited to contribute to daily reflections for the season of Lent, which will be compiled into a book of Lenten Meditations. This book will be available beginning Sunday, March 3. If you are interested in contributing a reflection, or two, you can see which days are available, and sign up for the day(s) you would like, online here. If the "Writer" column is blank, add your name next to the specific day you are selecting. You can find full copies of the 40 specific meditation passages by day here. All are welcome to contribute! Please consider lending your voice and your perspective to this creative project. Contact parishioner Alice Landis with any questions (alice.j.landis@gmail.com). The Thursday evening meditation group has been going strong since September and we're looking forward to continuing offering this group consistently moving forward. However, because Rev. Claire will be out of the country for much of February and then we'll be hosting the annual Lenten Study Series through March on Wednesday evenings, the group will temporarily be on hold from Thursday, February 14 through Thursday, April 18 (Maundy Thursday), recommencing on Easter Thursday, April 25. Please let Rev. Claire know if you have any questions. About ten minutes of the Annual Gathering was devoted to some structured table conversation with vestry members and other volunteers taking notes. We've assembled those comments and the cards themselves are posted on the bulletin board in the Parish Hall lobby. Each week for the next several weeks we also will be sharing the responses to one of the four questions asked. If these conversations sparked other ideas please feel free to reach out to Rev. Claire or another member of the vestry - we would love to hear from you! If you missed the annual gathering, there are blank cards posted on the Parish Hall lobby bulletin board where you can feel free to add your thoughts. 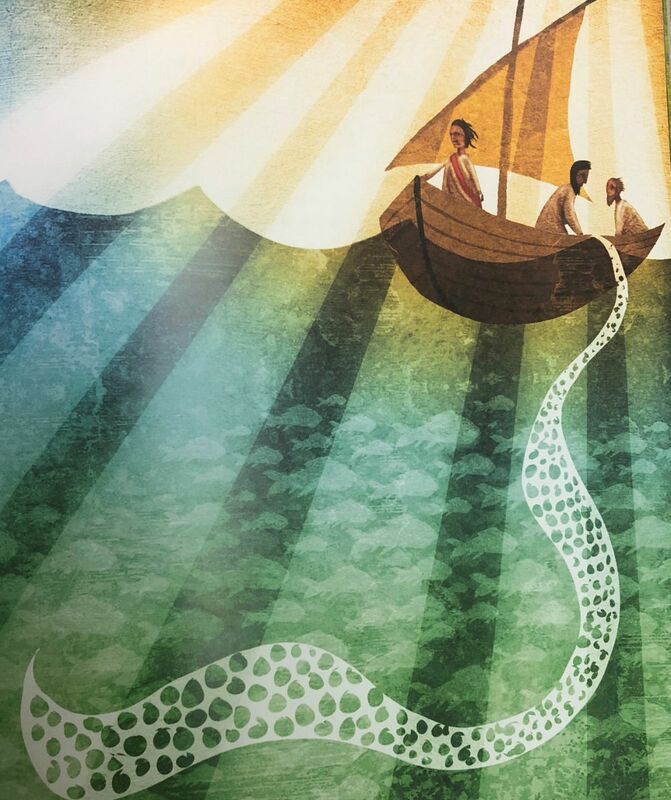 How might we invite others to join us in the year ahead? Where might we also be more present in the wider community? If you know teenagers who may be interested in making a little extra money helping clean up and wash dishes after parish events, please contact Deanne in the office (office@ccla.us). We will pay $15/hour. If you would be willing to post/distribute flyers about Christ Church Events to stores on bulletin boards (stores, Starbucks, etc. ), please contact Deanne in the office (office@ccla.us). Weeknight Services/Events Timing - We only received one response to this question. If weeknight timing matters to you, please share your feedback. As we plan for Ash Wednesday and Holy Week services, we are asking for your input on timing. We want weeknight (Monday-Friday) services and parish events to be timed to accommodate the most parishioners possible. If you/your family are likely to attend a weeknight service (Ash Wednesday, Maundy Thursday, Good Friday) or a weeknight parish event (Lenten Soup Studies, Parish Potlucks with speakers, Summer BBQs), please provide feedback on the timing that works best in your schedule here. As we have shared over the past two weeks, we have contracted with Nzilani Glass Conservation Inc., to do an intensive survey on the physical condition of the stained-glass walls in the church. Last week they examined every inch of the windows, visually documenting their condition for a comprehensive printed report. We’re hoping for a good bill of health, but if they do find areas of concern, the Survey report will help us pinpoint them and prepare for future restoration. Thank you to those of you who have responded to our ask for contributions of any amount to help offset the remaining $6,000 project cost following the initial $10,000 donation from a parish family. 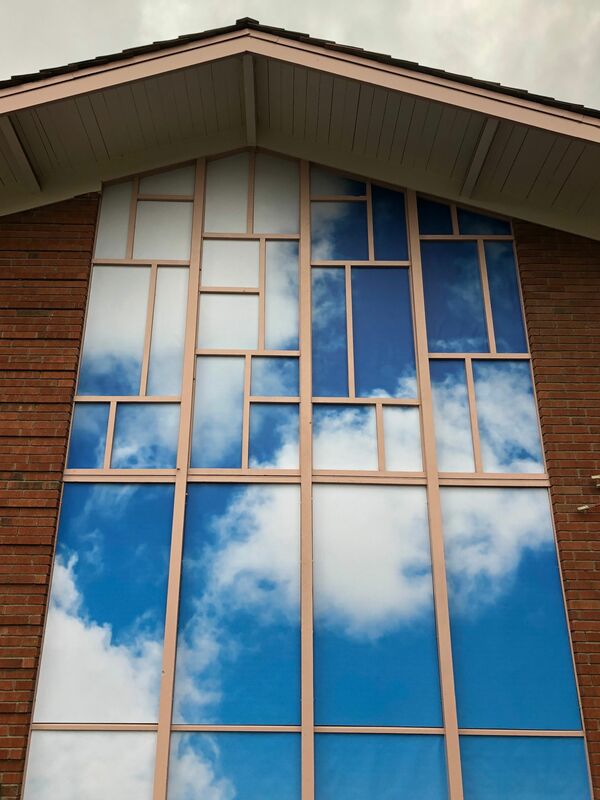 If the Windows and their future are important to you and your worship among us, please feel free to contribute any amount – large or small – to help us meet our goal. Contributions to “Windows Survey” can be made online (credit/debit card or bank account) or via check in the Sunday plate or mailed to the office (Windows Survey on the memo line). For more information on this conservation project, please contact Lauren Arnold at laurenarnold@cs.com. As we all well know, affordable housing is a significant local issue and one of increasing concern. Many solutions are being proposed and worked on across the Bay Area. One that can happen right now is house sharing. House Sharing is when two or more unrelated people share a home. This could be a homeowner renting out vacant bedrooms, or two or more people renting a home together. In the right situation this can be beneficial for the renter as well as for the owner. Catholic Charities is operating a House Sharing Program in Santa Clara County. We wanted to make this information available in case you or someone you know is looking to share a house, or looking for an affordable housing option. We are thrilled to have a new art installation from parishioner Sukey Bryan in the church through the Season of Epiphany. The installation is called "Sky Banners" and it is oil on canvas, 120 x 29" each (see photo to left). Sukey also has two large scale outdoor installations about sky as part of the "Sheltering Sky" group show at the Palo Alto Art Center, January 19 - April 7, 2019. Her pieces are "Sky Front" on the front of the building (photo to right) and "Sky Windows" in the sculpture courtyard. The Vestry is aware that we have parishioners who are not able to get here for Sunday services on their own. If you would be able to provide Sunday rides, or know someone who needs a ride, please contact Deanne in the office (office@ccla.us). 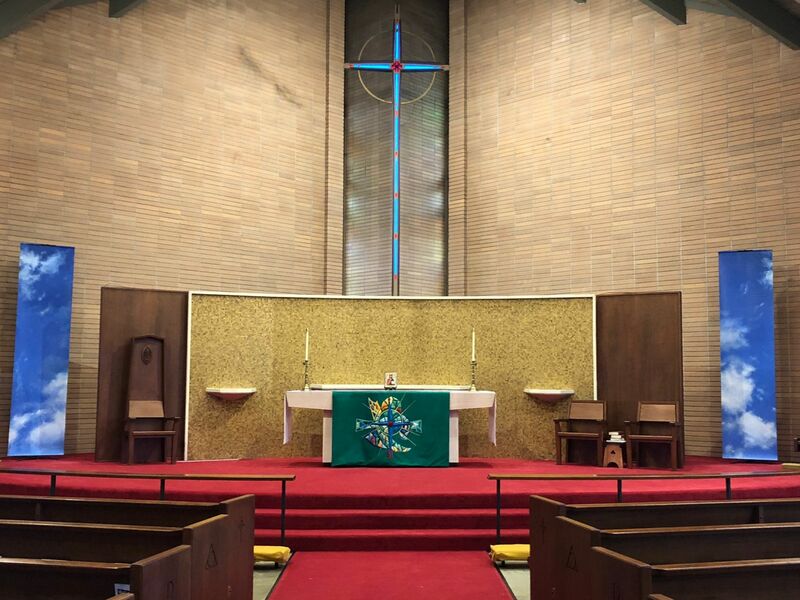 Copyright © 2019 Christ Church Los Altos, All rights reserved.